NASA SimLabs III - SYMVIONICS, Inc.
SYMVIONICS, as a subcontractor to Metis Flight Research Associates, LLC (MFRA), was recently awarded NASA’s Technical Services for Aerospace Modeling and Simulation (SimLabs III) contract, beginning operations at NASA Ames Research Center (ARC), Moffett Field, CA on June 1, 2018. MFRA is an unpopulated small business joint venture, comprised of Metis Technology Solutions as managing partner, Flight Research Associates, and SYMVIONICS. SYMVIONICS has also supported the two predecessor contracts, continuously since 2005. SimLabs III is an indefinite delivery, indefinite quantity contract with a period of performance of one-year base period and four one-year options. Services provided under this contract include: systems engineering; software development and systems administration; aerospace engineering and applications programming; graphics programming; simulator hardware and mechanical systems engineering and operations; safety and mission assurance; configuration management; outreach and subject matter expert recruitment; and related contract management functions. 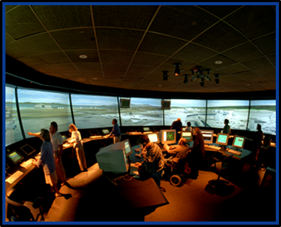 The NASA ARC Simulation Laboratory Facilities are unique national research and development facilities dedicated to providing researchers with high-fidelity environments to conduct simulated flight and air traffic management (ATM) research and advance the state-of-the-art of simulation technology. Researchers use the facilities to investigate a variety of topics ranging from the design of new aircraft guidance and control systems to the human factors implications of new or existing flight deck displays, airspace operations, air traffic control and automation. In-house projects and experiments are conducted to develop new simulator systems and subsystems, improve simulation systems, develop advanced engineering techniques to improve the fidelity and validity of simulation programs, and incorporate the latest technology into simulation systems. 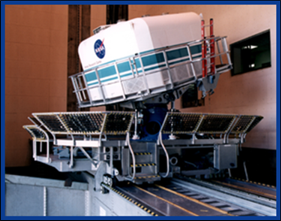 The NASA Ames Simulation Laboratory Facilities support are primarily comprised of the Crew-Vehicle Systems Research Facility (CVSRF), the Vertical Motion Simulation Complex (VMSC) and FutureFlight Central (FFC). 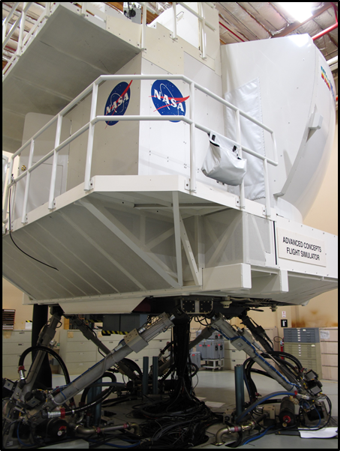 The simulation facilities are used by NASA programs, other NASA Centers, the Federal Aviation Administration, the Department of Defense, the National Transportation Safety Board, other government organizations, industry, and universities.